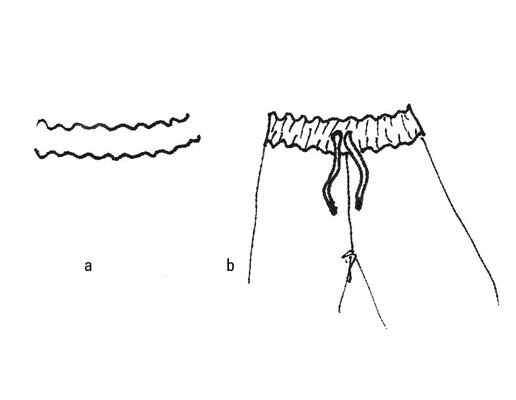 Start the waistband by drawing two curved horizontal lines parallel to each other. 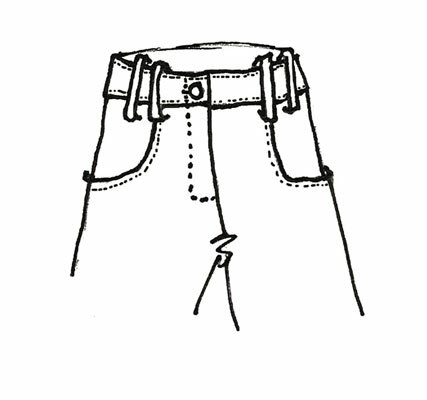 The belt loop lines go on top of the waistband, so draw these curved lines in pencil first. When you’re finished with the drawing, you can go over it with a pen and erase the pencil lines. Connect the lines with short perpendicular lines on both sides. Draw the center front line, a straight line directly down the center that extends below the band. 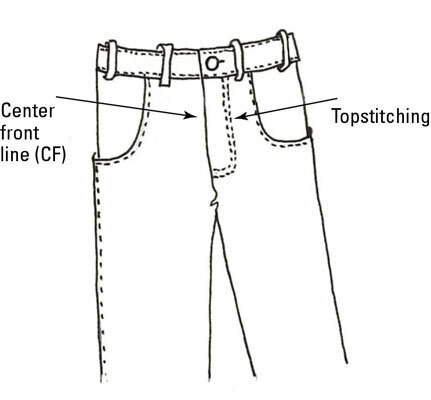 The inseams will extend from the center front line when you draw the pant legs. At the end of the center front line, draw a little z shape to designate the crotch. Add a button to the right of the center front line and draw a short horizontal line coming off the button for the buttonhole. The placement of the button on either the right or left side of the center front line has no real rule. For men’s clothing, you usually place all buttons — regardless of whether they’re on shirts, jackets, or pants — on the right side (so the buttons are on their right when they’re wearing the garment unbuttoned). For women’s clothing, buttons are typically placed on the left side. However, it’s become a trend in the apparel industry to put all buttons on pants, especially jeans, on the right side. At this point you can leave the waistband simple with only the button, or you can add belt loops. Create a basic belt loop for your fashion pants. Start with a long, narrow c shape. Whether you’re drawing on the left or right side of the center front line determines which direction the opening of the c faces: The opening should be toward the center front line. To the right of the center line, you’d draw a backwards c.
Add a short, straight, horizontal line at the top of the c and another at the bottom of the c. These lines should be opposite the opening of the c. Connect the ends of the two lines with a vertical line. Put it all together with a waistband, button, and belt loops. here’s no rule on the number of belt loops on a waistband. It’s typical to have two in the front and three in the back, but you may see as many as four in front and three in back. It’s all up to the designer. Stretch your skills by adding an elastic waistband. 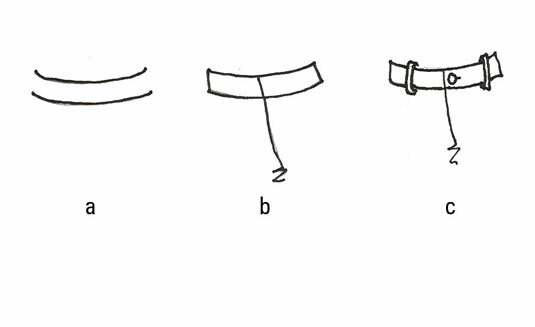 To indicate an elastic waistband, draw two curved, horizontal, squiggly lines. Connect the ends of the squiggly lines with short, vertical lines. Add lines going up and coming down from both curved lines to indicate gathering. Vary the lengths of the gathering lines. Finish the pants with a center front line, the crotch z line, and some side seams. Sometimes elastic-waist pants have drawstrings, so draw those, too, if you like. Starting toward the bottom of the center front line, draw a short, dashed, curved line that goes to the right of the center front line and up to the waistband, creating a J. 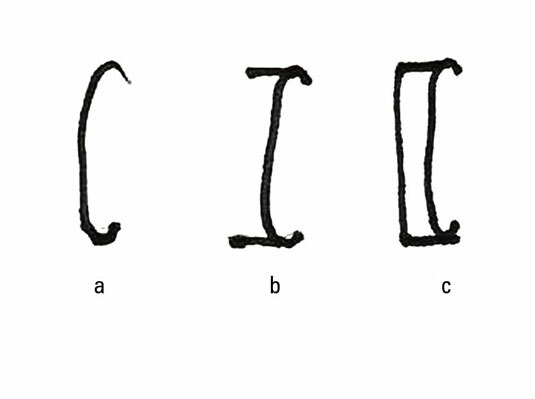 The J-shaped line of the fly must be dashed because it represents stitching. A solid line would represent a seam, and every designer knows there’s not a seam there. The solid center front line must be centered, or your model will appear asymmetrical. The fly can go to the left or the right of the center line. Today’s fashion trend is to place almost all buttons, including the button on the fly, on the right side. But like most fashion rules, this rule is made to be broken. Some fashion designers follow the traditional placement of men’s buttons on the right, women’s on the left. If you place the fly to the left of the center front line in your drawing, use a backwards J shape. Draw a second dashed line right next to the first one. Together, these two lines represent two rows of topstitching. Draw alternatives to the traditional fly. Not all pants have a front fly opening, but always think about how the person is getting in and out of the pants. If there’s no front fly, then the fabric must be really stretchy (think leggings or maternity pants) or must have an elastic waistband. Sailor pants are another example of pants without a traditional fly front; they have a front panel that buttons on the sides. 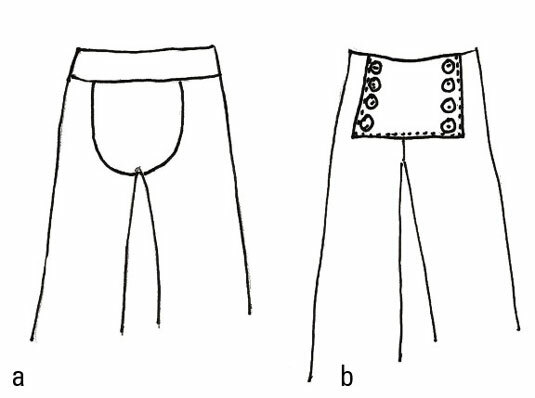 Dressier pants may have a hidden side zipper (also called an invisible zipper) that keeps the front of the pants smooth.